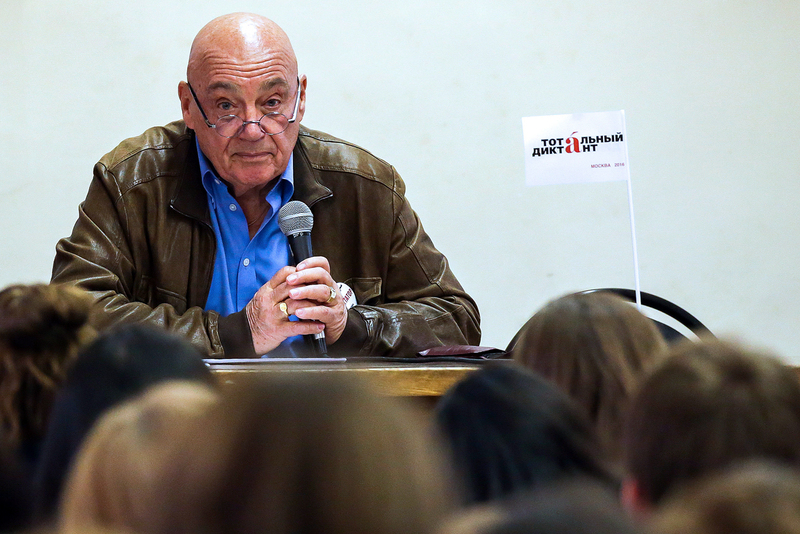 TV host Vladimir Pozner during the annual international educational action "Total dictation" in the Russian State University for the Humanities. A reading featuring the world-famous journalist will rate participants’ understanding of spoken English. On Nov. 30, Muscovites and visitors to the Russian capital are invited to attend a special event at the Plekhanov Russian University of Economics to test their English. The event, entitled “Spell Well,” will involve writing a dictation read by prominent journalist Vladimir Pozner. Pozner, who currently hosts a talk show on Russia’s Channel One, was raised partially in New York. The text for the dictation will be taken from a novel by a young British author and will highlight the characteristics of contemporary English. The project is sponsored by the British Council, Plekhanov Russian University of Economics and Moscow IELTS Centre. Participation in the event is free; registration is available here. After Dec. 15, the text of the dictation will be published on the website of the British Council and the results will be announced. The 10 participants with the best results will receive certificates for a free IELTS preparation course and exam as well as an autographed copy of English Grammar in Use by Raymond Murphy. "When it was suggested that I be an ‘elocutioner,’ I agreed at once, without thinking a single minute,” said Vladimir Pozner. “And then I thought: ‘Why did I say yes so quickly?’ Probably, because of unconscious thankfulness for Winnie the Pooh, and Mowgli and Cheshire cat, and Robin Hood, and all the characters that formed me as a person. If as an elocutioner I will be able to boost the Russian audience's interest of English language and literature, I will be happy."